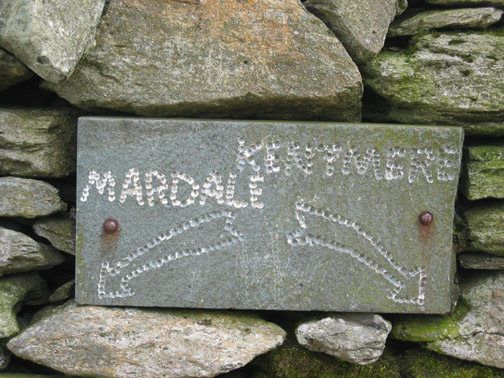 " High Street and Mardale Ill Bell "
Date & start time: Saturday 1st June 2013, 12 noon start. 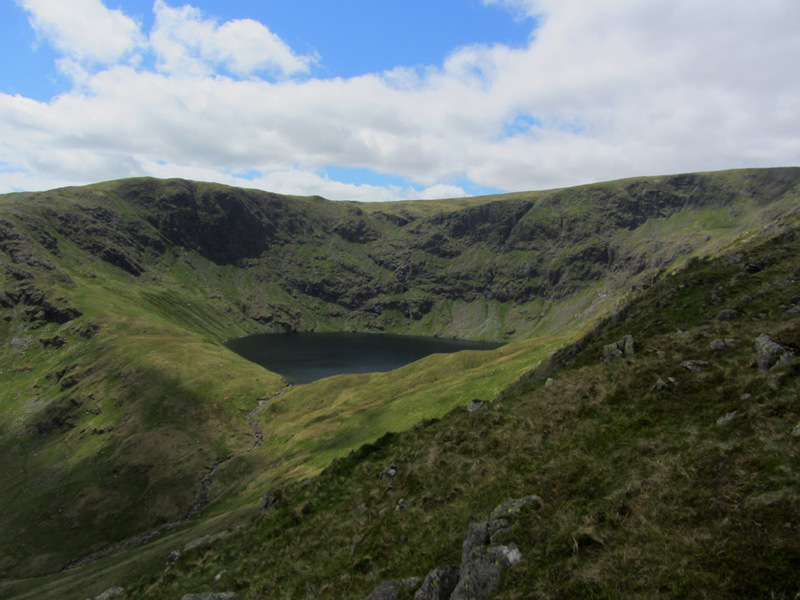 Places visited : Rough Crag , Long Stile, High Street, Mardale Ill Bell, Nan Bield, Small Water. 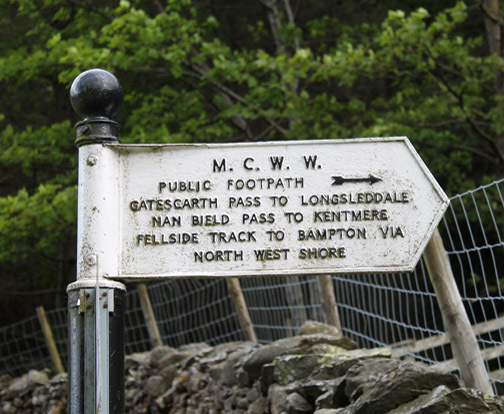 Walk details : 6.5 mls, 2150 ft of ascent, 6 hours. 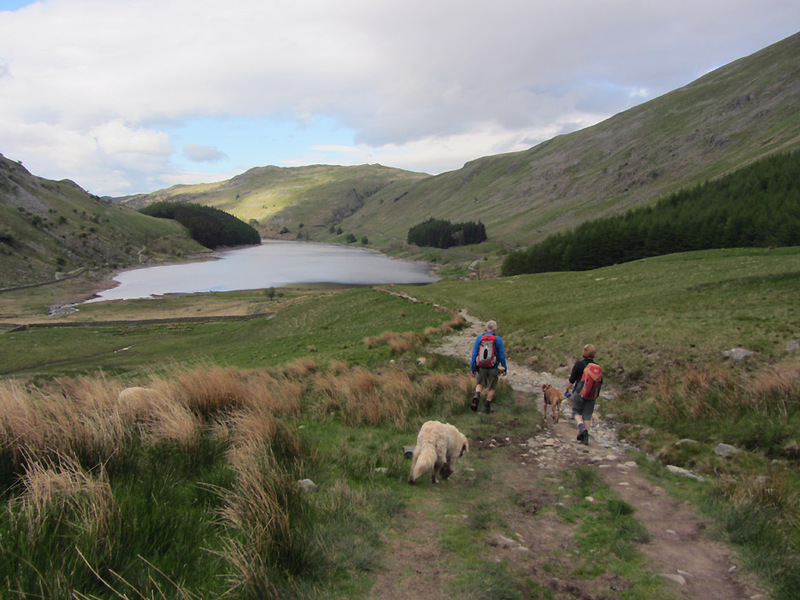 so this Saturday we drove over to the head of Haweswater for a classic walk via Rough Crag, High Street and Mardale's Ill Bell. A bright new sign at the car park to brighten the start of the day. 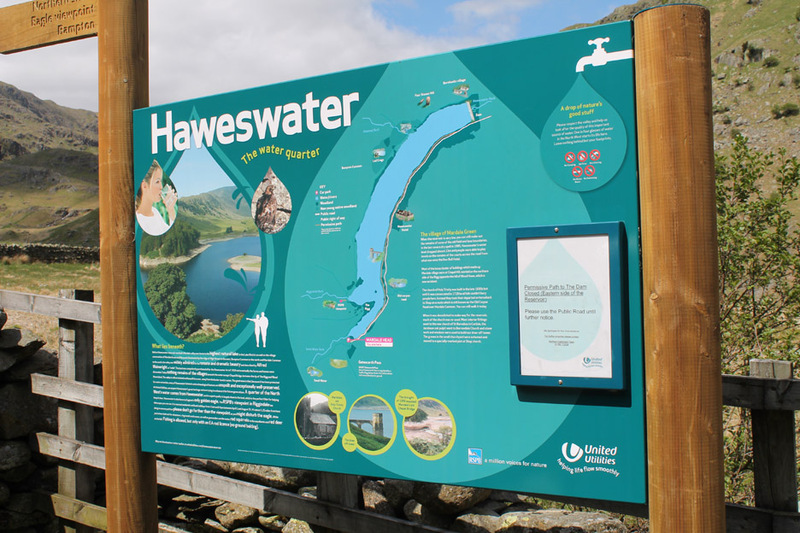 Apart from advocating the benefits of the water, the sign also advertises the lakeside path on this side . . . with the note that the path is closed ! 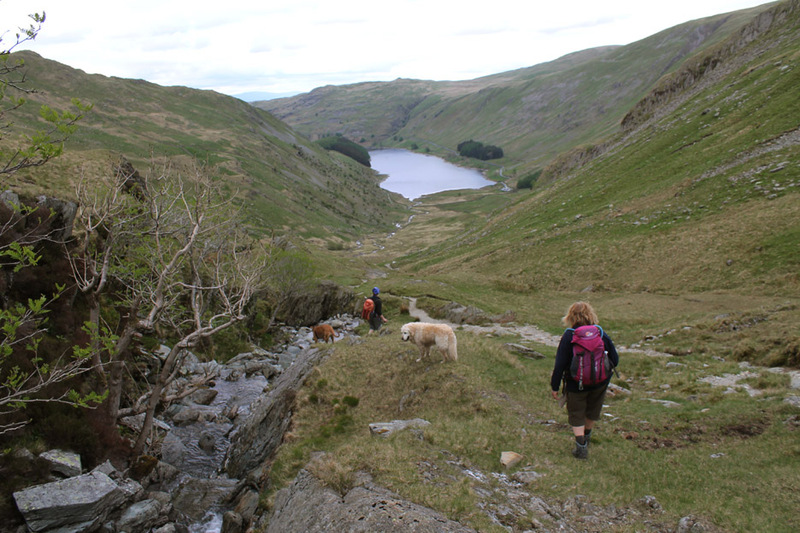 The view up the valley from the road as we approach the head of Mardale. 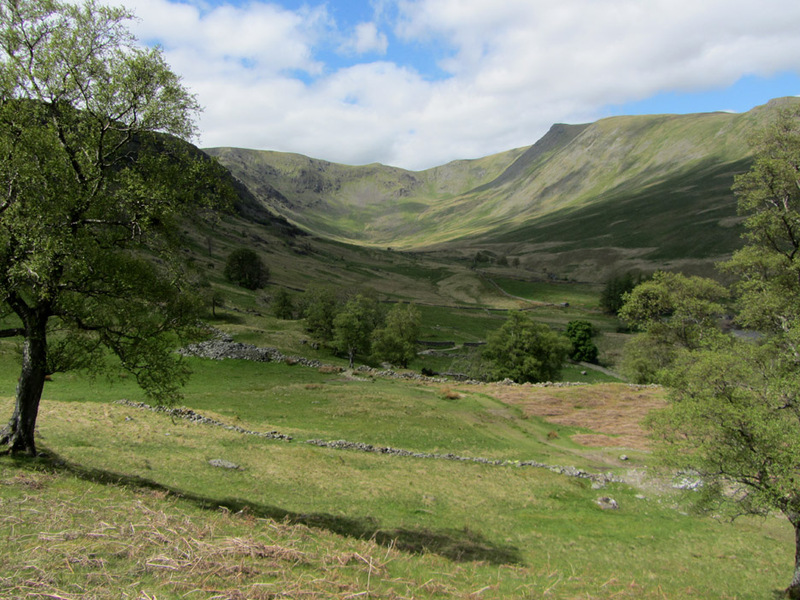 The classic view across to the tree covered 'Rigg' and the valley of Riggindale to the right. 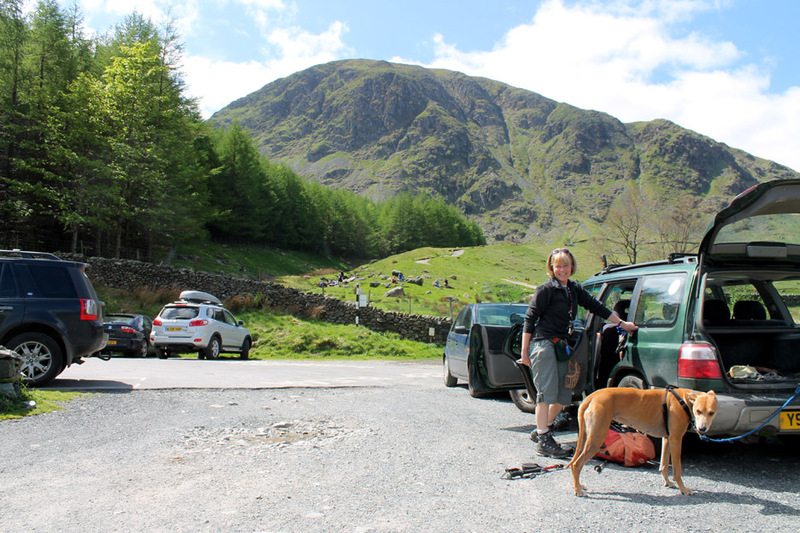 Jo gets herself and Amber ready for a day on the fells. before branching off round the lake. 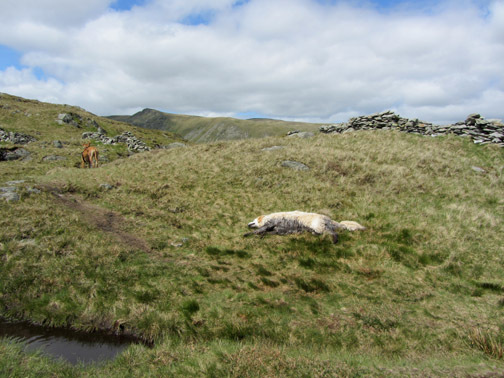 but from the top at Nan Bield Pass later in the day. 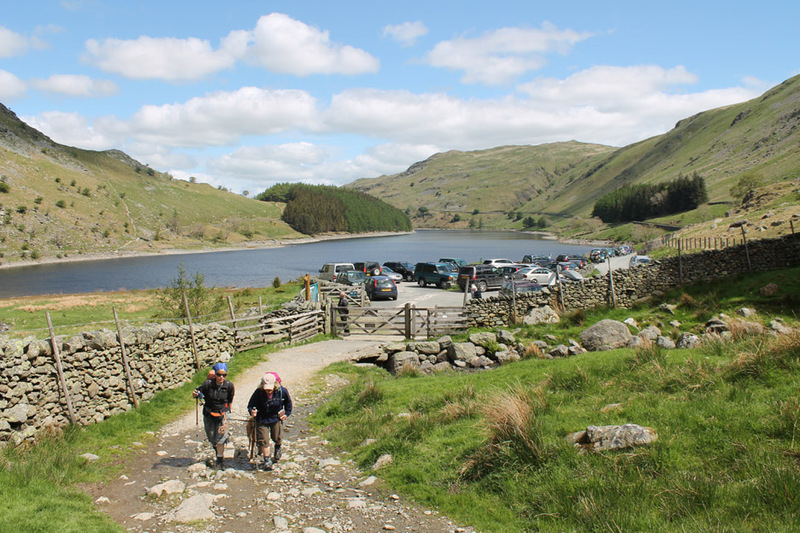 Looking back at the car park as we start our walk. 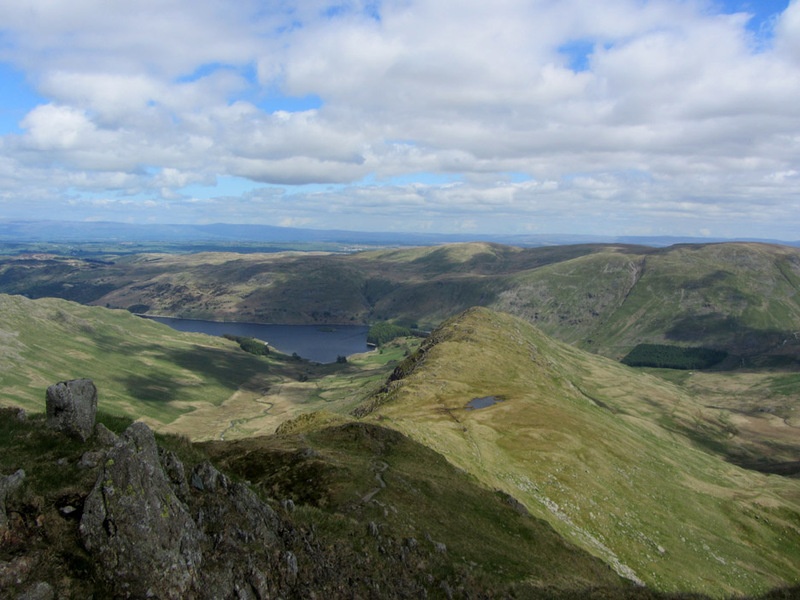 The view that greets us as we climb up onto The Rigg . 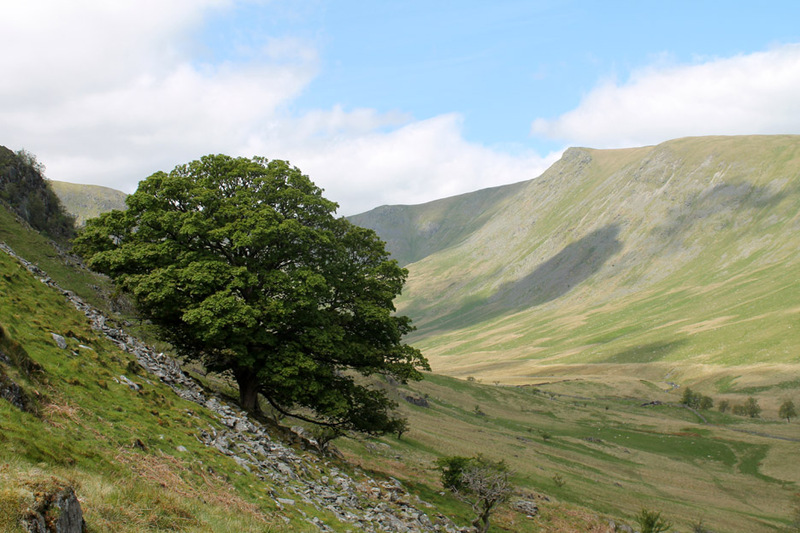 . . the tree covered promontory at the start of the Rough Crag ridge. 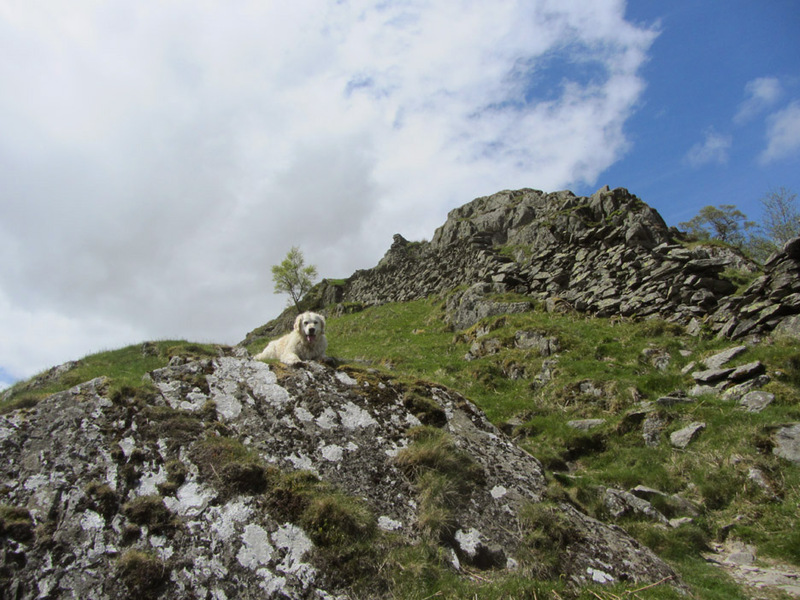 Looking over to Speaking Crag basking in the sunshine. 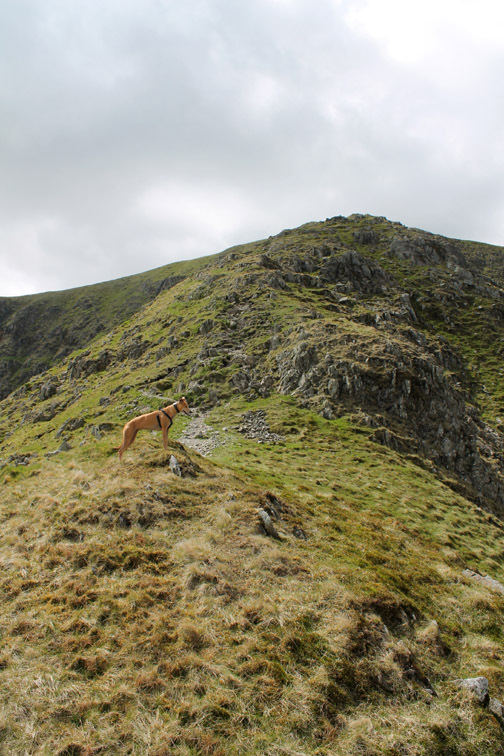 This was once home to the Lake District's last eagle but I don't think he has been seen for quite some time. 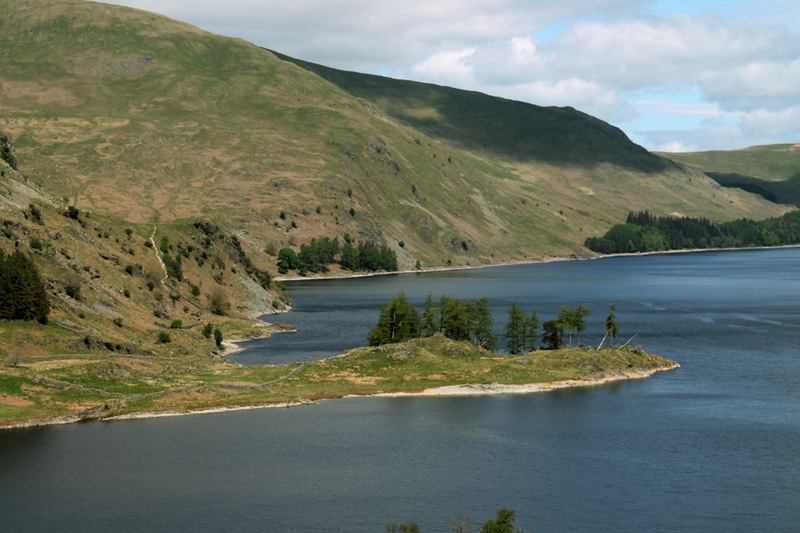 Just catching up on your website and noticed that you mentioned the Golden Eagle in the Haweswater area. This is my last picture of it (all be it a poor image!) taken in 2009. 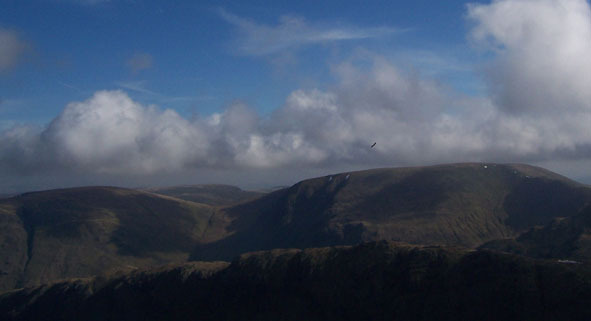 It's such a shame not to see the pair of them soaring over the valleys, I wrote to Lakeland Walker Magazine some time back asking if anyone knew if they were intending trying to find a mate, but it seems that it is not on the cards to replace the 1 let alone the 2 birds. 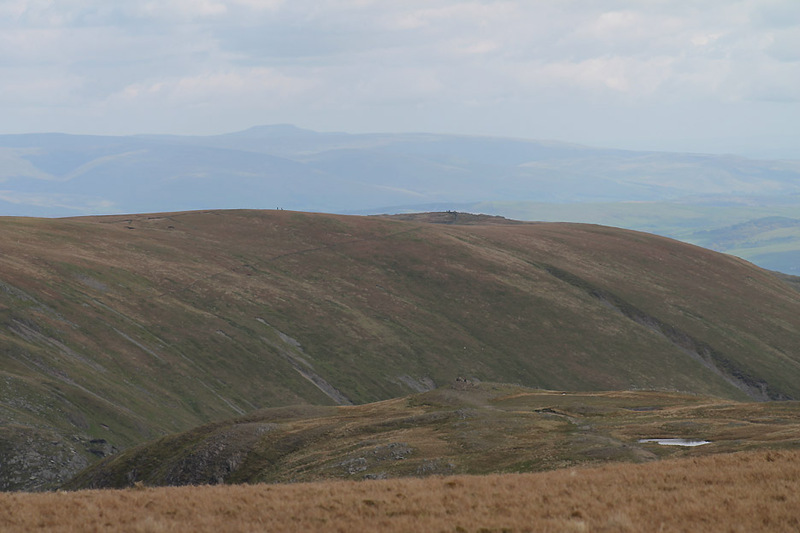 I find that strange really because we have got the Red Kite back in numbers here in Powys? Strange ! Does anyone know any more on the subject ? A fine oak tree now in full leaf . 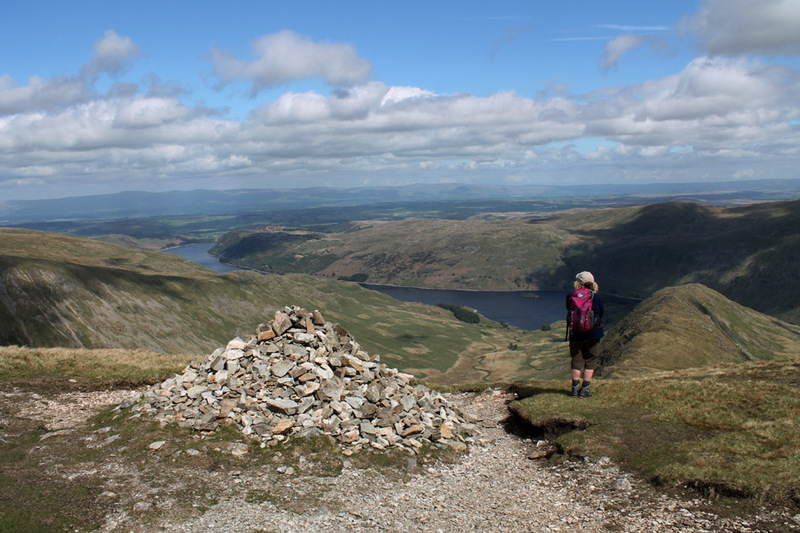 . . opposite is the recognisable craggy outline of Kidsty Pike. The full picture . . . thanks to the lady in red for adding the dash of colour. Time to start the climb. Take it steady as it is a warm day. The other way to stay cool is to have a dip . . .
. . . the muddier the better. 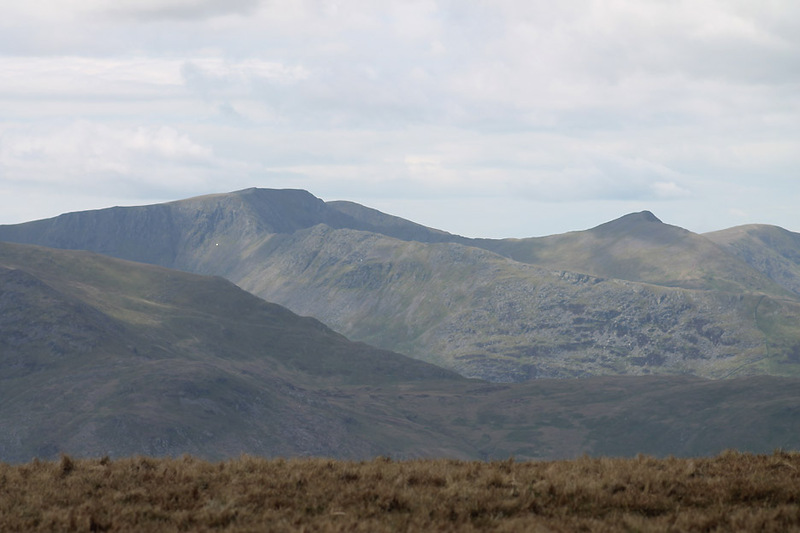 Looking across to the Gatesgarth Path from Rough Crag . . .
. . . and to our right at Nan Bield Pass and Small Water. 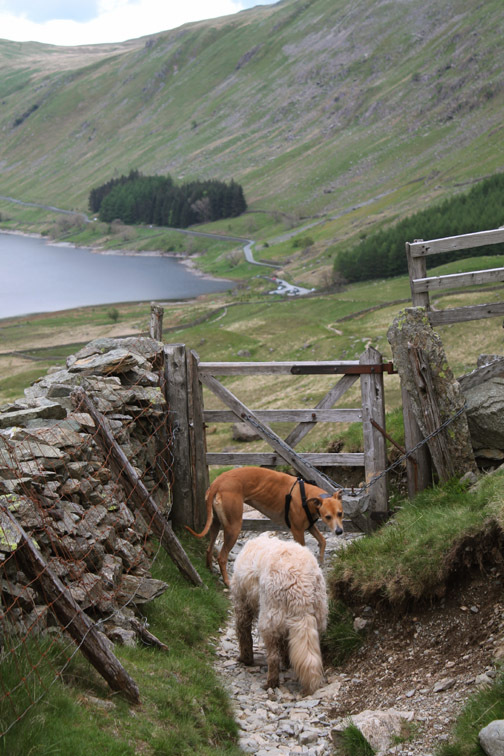 Gatesgarth takes you over to Longsleddale where we climbed Kentmere Pike in the snow just six weeks ago. 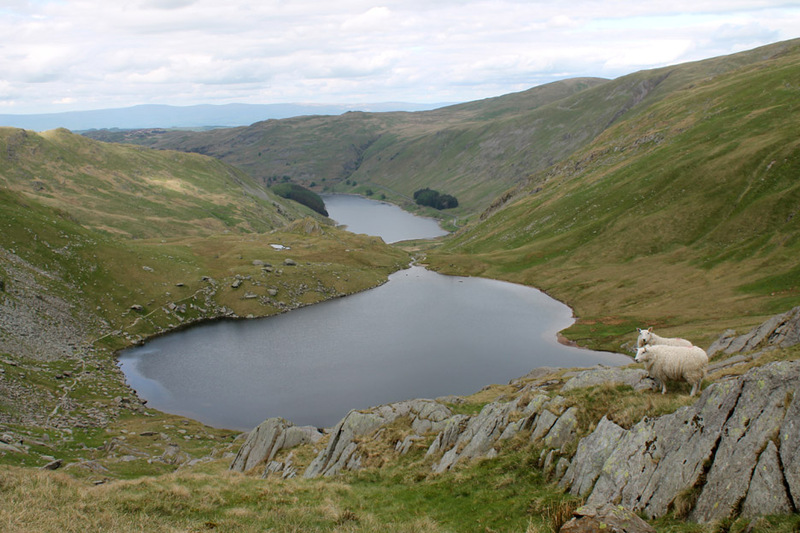 Nan Bield is for travellers who wish to travel over to Kentmere village and on towards Kendal away to the south. 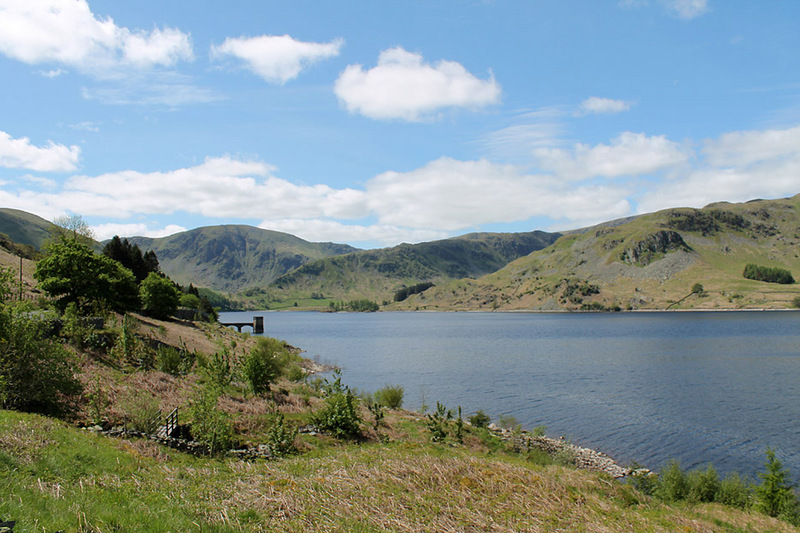 to help power the mines and quarry that exist just a little further down the fell side. 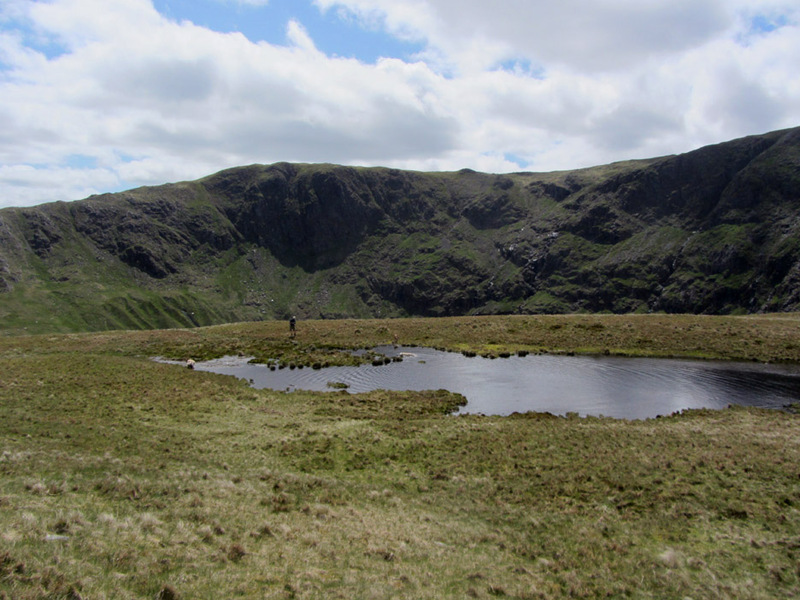 some holidays mapping and sounding Lake District tarns. way out from the back of the cwm. 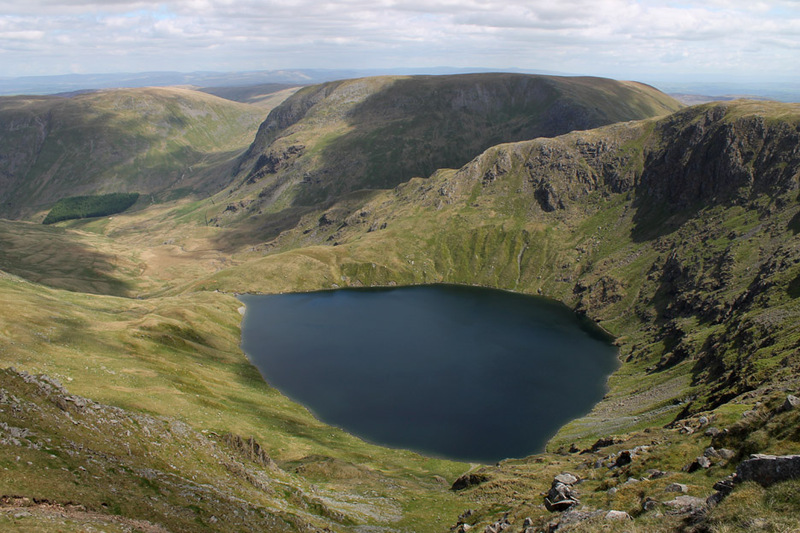 data was accepted by the Ordnance Survey, who checked our methodology. I'm not sure whether they ever made use of it. topographically less interesting, but gloriously situated. website keeps me in touch. Best wishes, Pat Malone, Wadebridge, Cornwall. 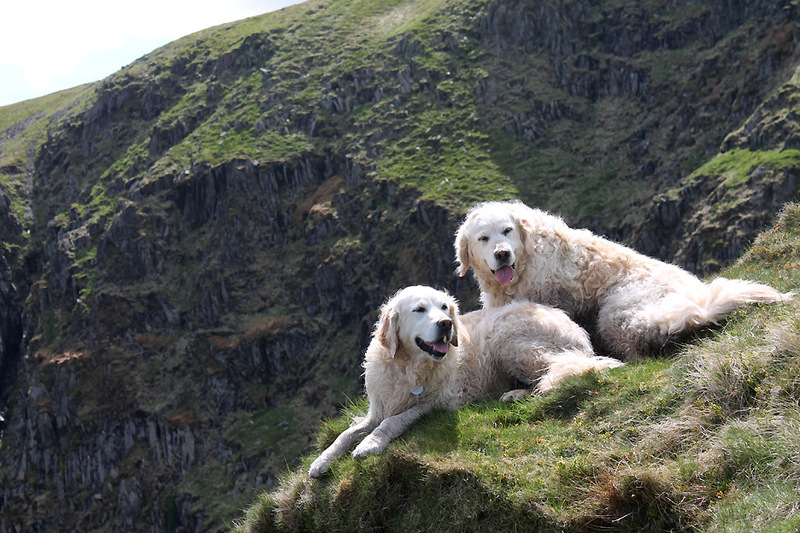 A brief photo stop for Jo and I on the way up Rough Crag. 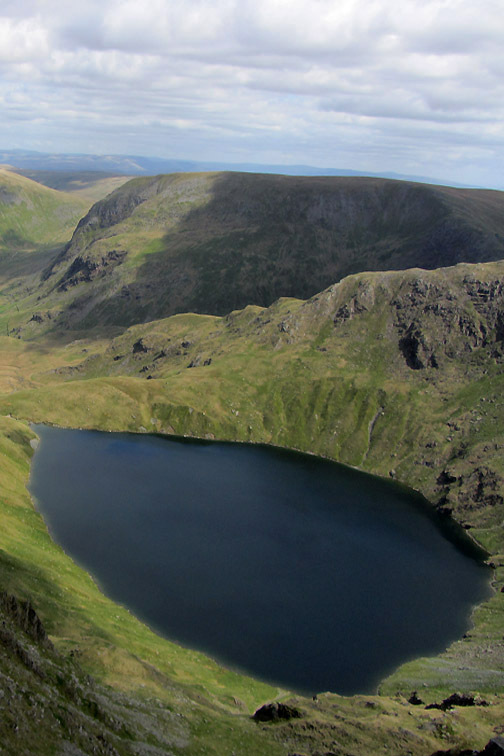 Caspel Gate Tarn . 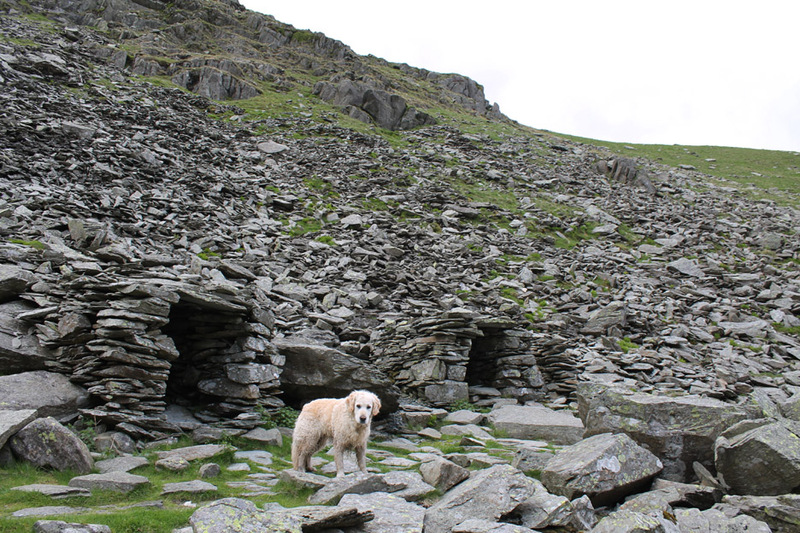 . . on a patch of level ground between Rough Crag and Long Stile. and it is time to go back across to meet up with the girls before they disappear out of the picture. 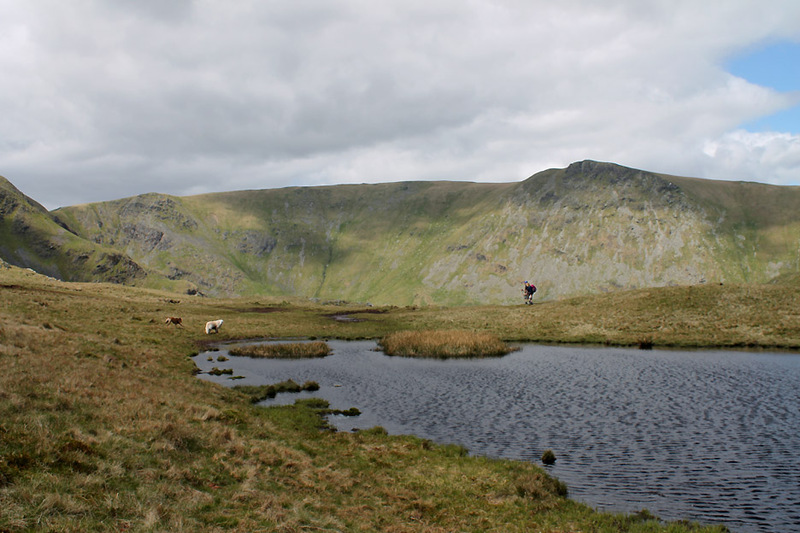 Looking back at the same tarn. 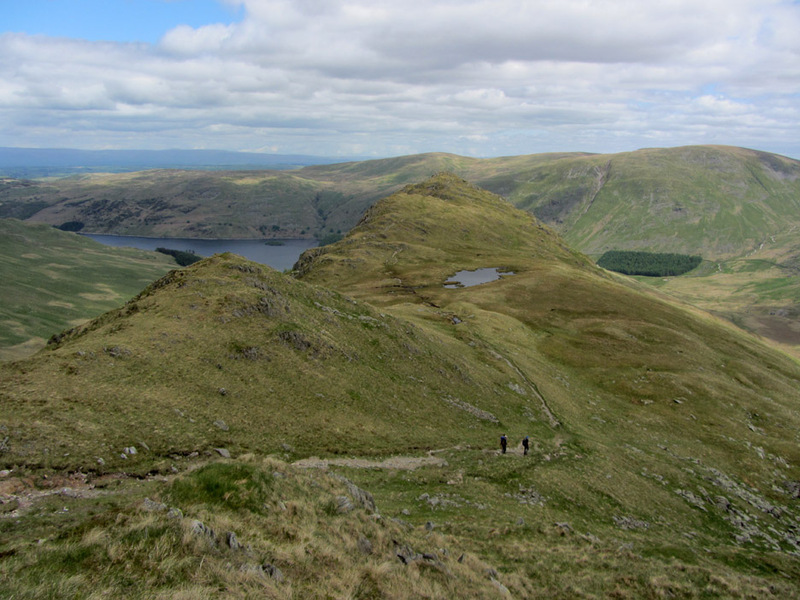 The two figures down below are fellow walkers on the way down . . . not Jo and Ann on the way up. This figure is Ann, part way up the climb. Just the last steep section to go. Wouldn't want to fall over the edge ! After all . 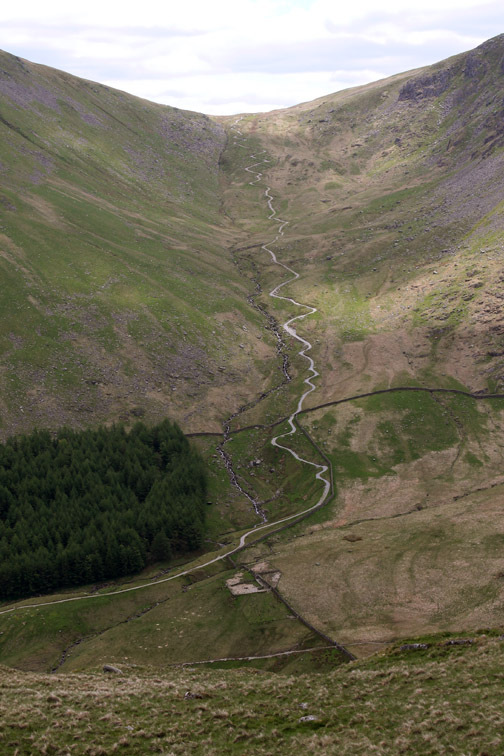 . . it's a long way down to Blea Water now. On the other side . . . Sale Pot . 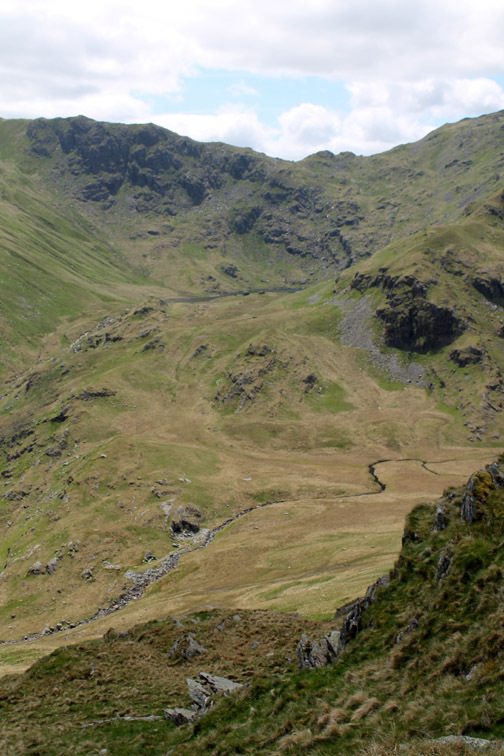 . . the head of Riggindale Beck underneath the crags of Short Stile,Twopenny Crag and Kidsty Pike. 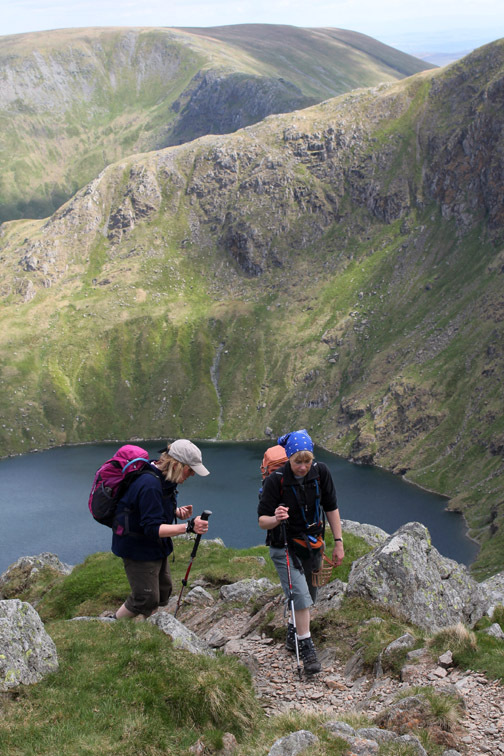 One of the nicest ascent routes in Lakeland . . . even more so on a nice day like this. Ann contemplating the view after the successful climb. 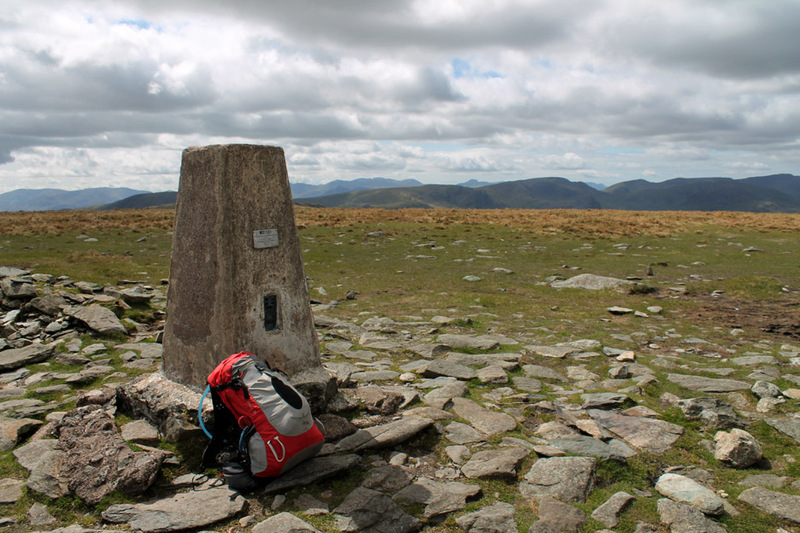 'Tis but a short wander across to the trig point at the summit of High Street.
" What are you doing up there ? " so I risk life and limb to bring you a panoramic photo from high above the summit. so we sit behind the wall, as thousands have done before, in order to enjoy some shelter for our lunch. Jo and Ann enjoy the view through a gap in the wall. 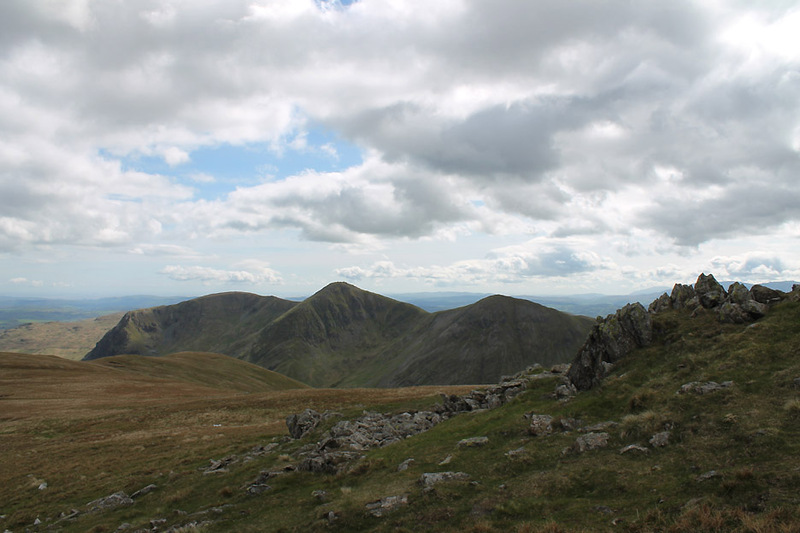 The tall pinnacle opposite is Thornthwaite Beacon . 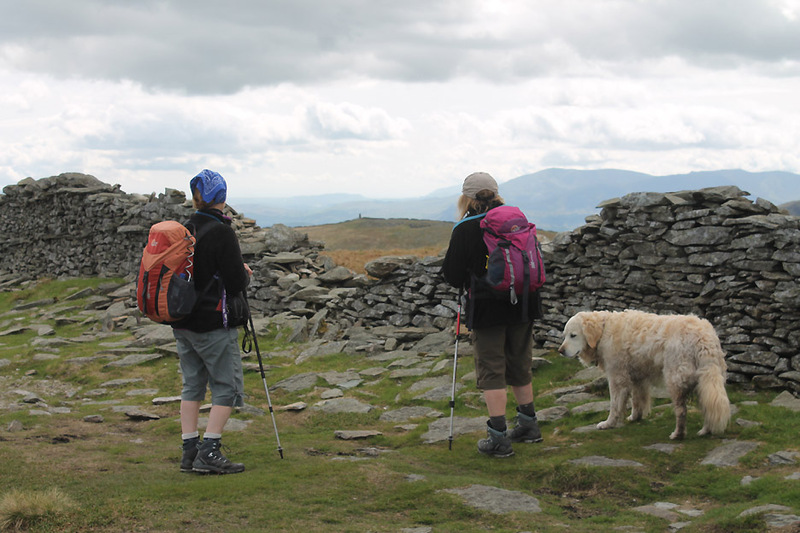 . . many a lunchtime we have sheltered over there too ! 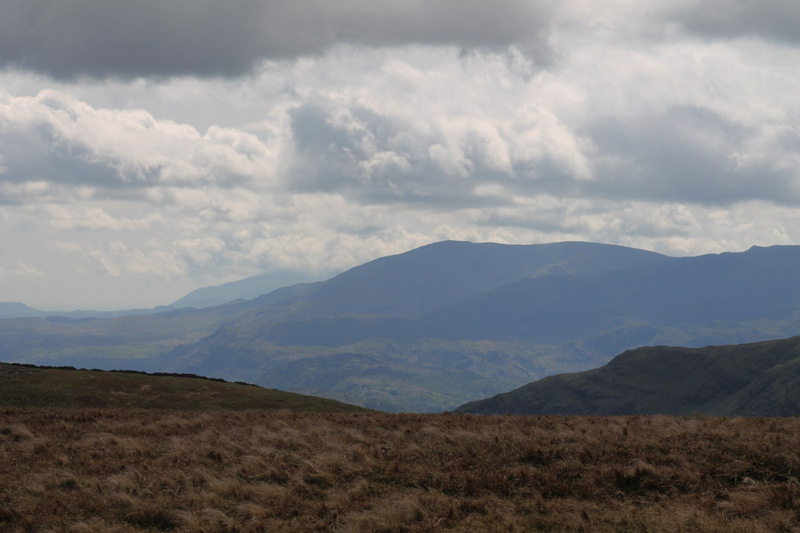 Zooming in we can see Wetherlam and distant Black Combe. 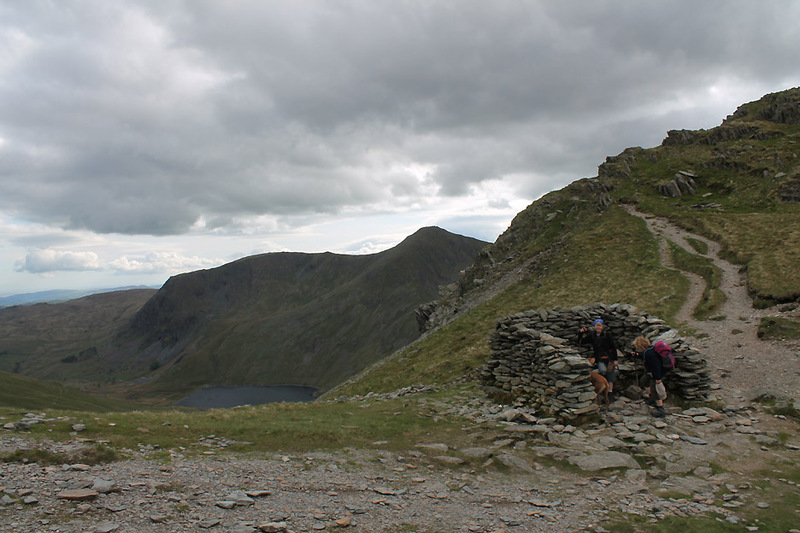 Panning round to the high summit of Helvellyn and the more pointed Catstycam. 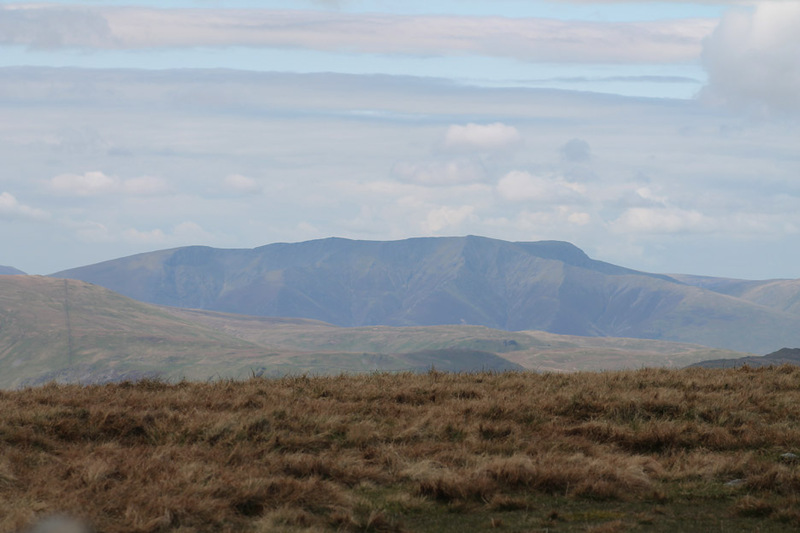 Blencathra, its front and valleys rather lost in the distant haze . 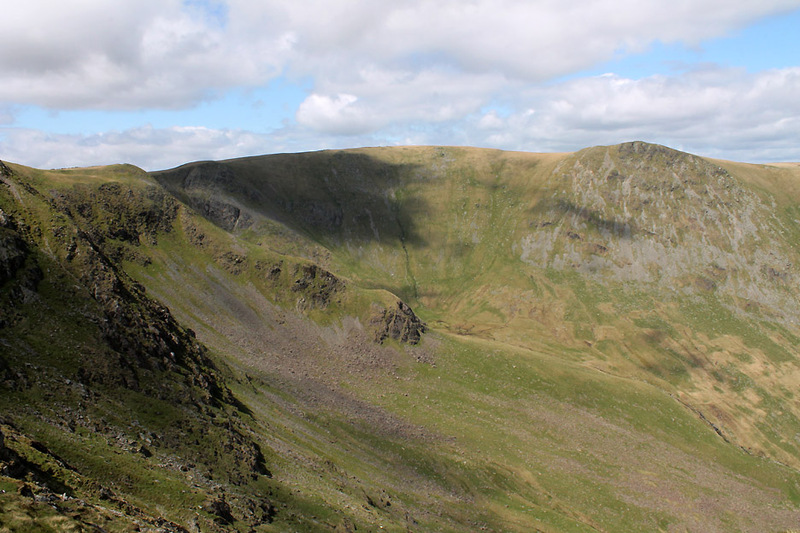 . . Sharp Edge is seen in profile on the right. 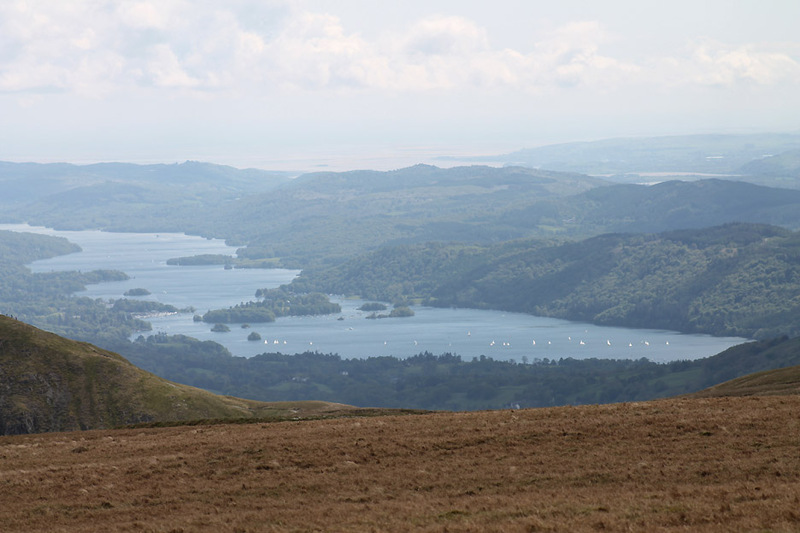 Looks a grand day for a sail on Windermere. 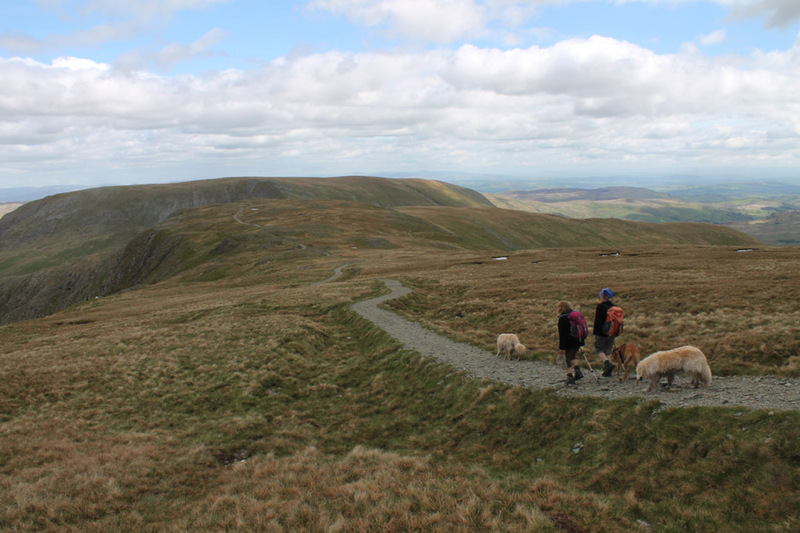 but looking ahead we can see Kentmere Pike and beyond that is Ingleborough, one of the Yorkshire Three Peaks. Join the motorway . . . don't get me started on this one again ! Mum and offspring . 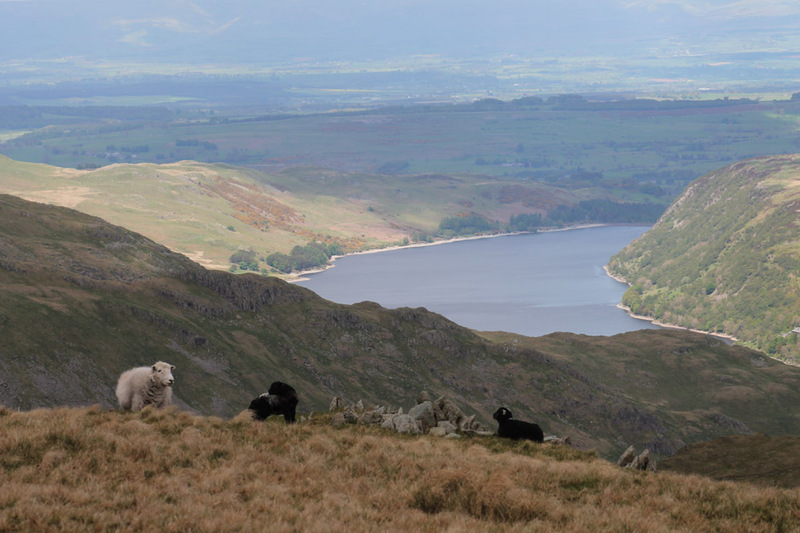 . . grazing high above Haweswater. 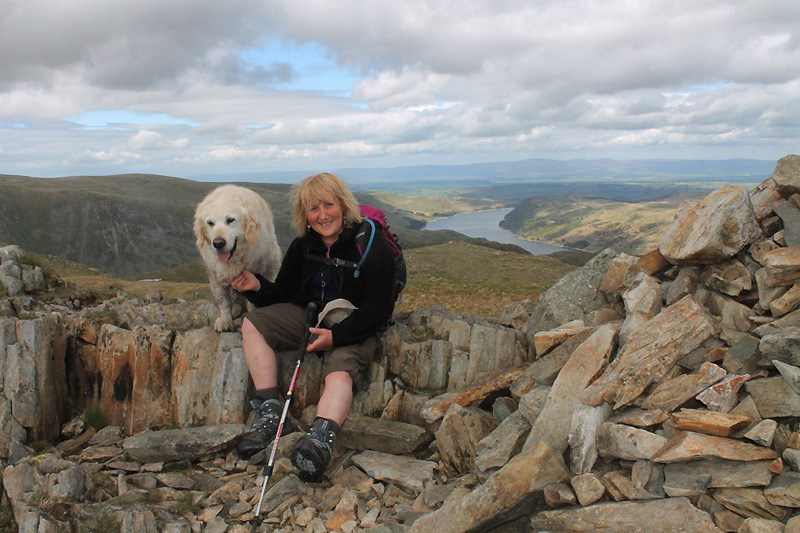 Harry joins Ann on Mardale Ill Bell summit. 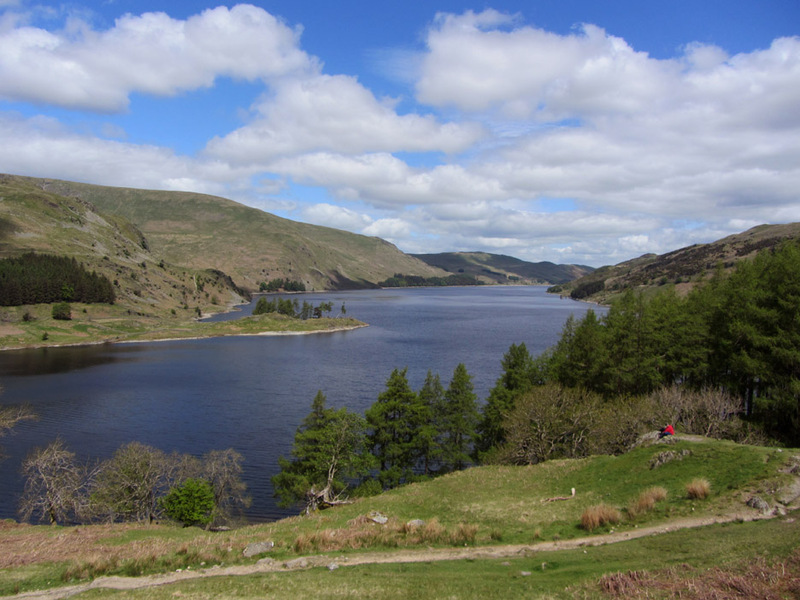 The view down to Haweswater is enhanced by the dappled light formed by the moving clouds. 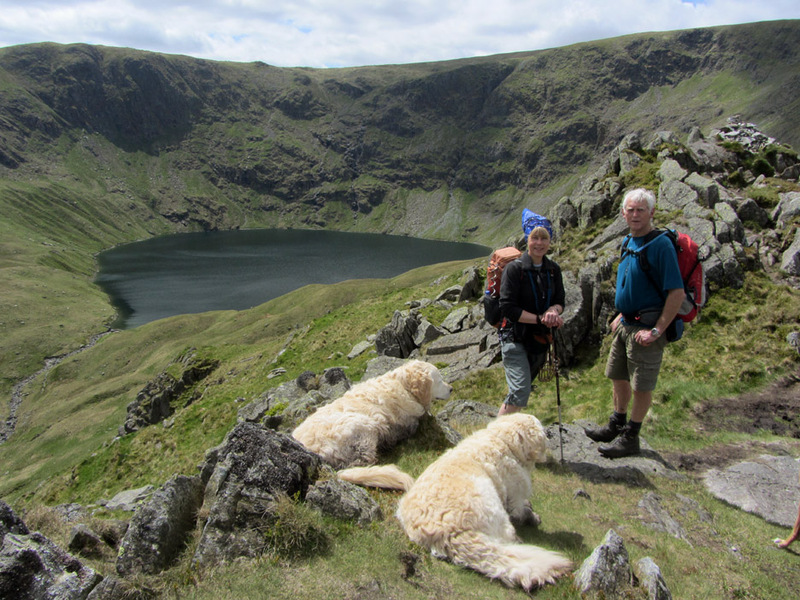 To our right, the other Ill Bell on the Kentmere Round . 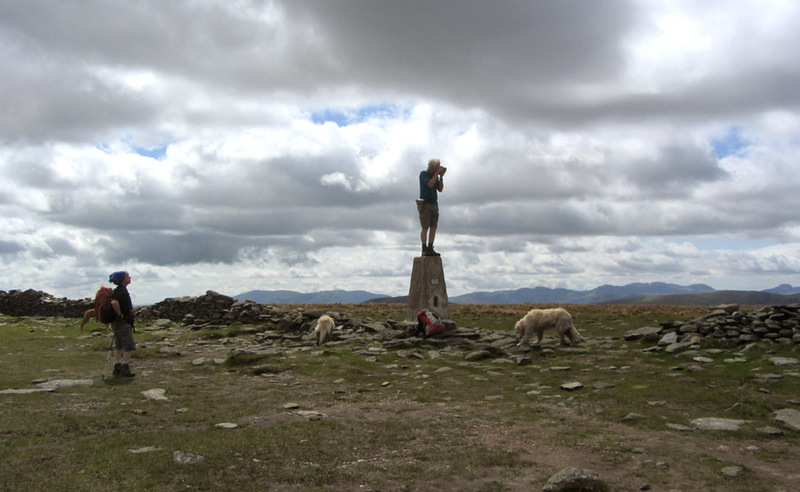 . . the middle one with three summit cairns. We were up there just a week ago. 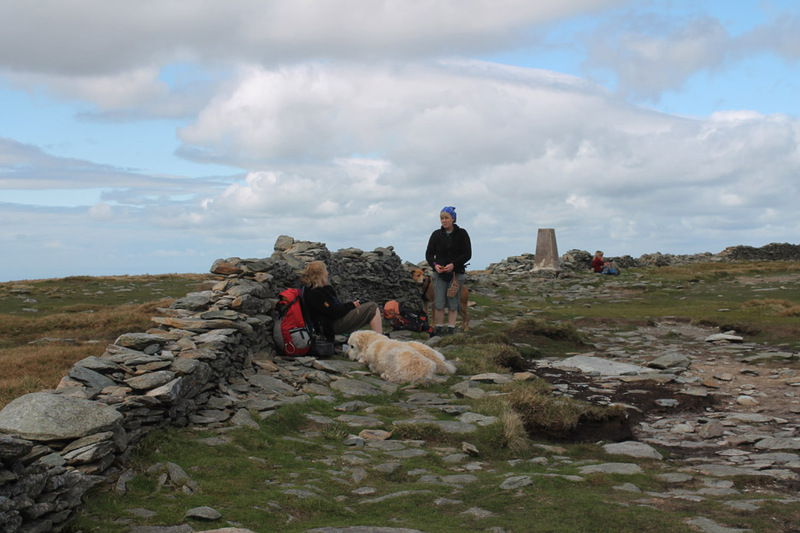 Nan Bield Pass and the recognisable three-sided shelter. his pony (if he/she had one) could get in and shelter too ! 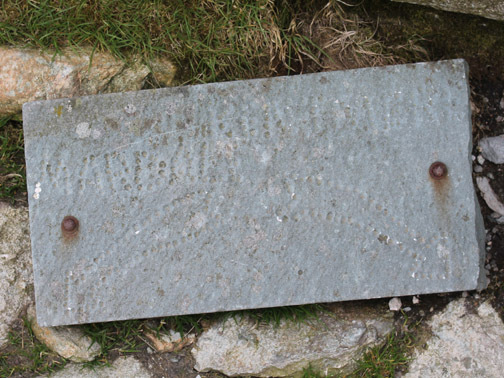 On the ground, looking un-cared for, an old signpost. The same sign in July 2004. What a coincidence . . . I had left a message for Tony in the shop today . . . but he wasn't in work to receive it. 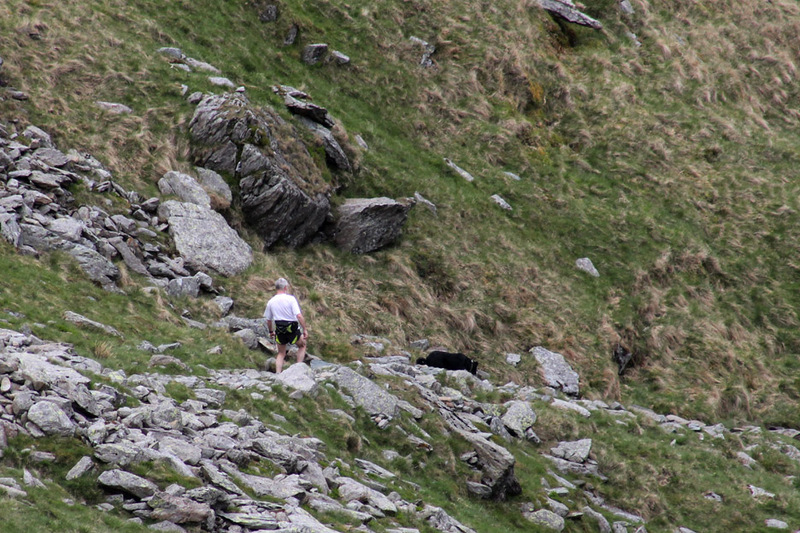 He was out here, running on the fells with his dog . . . so the message was delivered first hand after all. 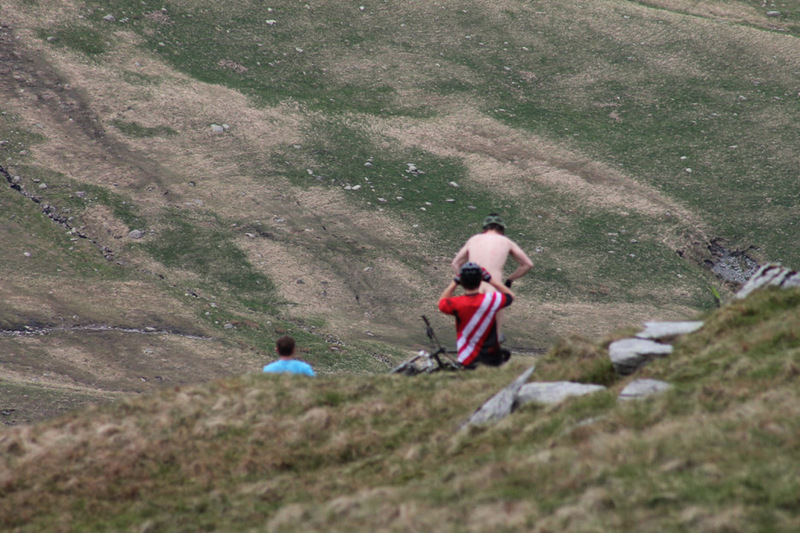 While we were on the pass there was a more unusual photo-shoot for one of these mountain bikers. Don't hold your cursor over the picture if you don't want to see his possible Facebook photo.
" He'll catch his death of cold if he doesn't put something woolly on ! " 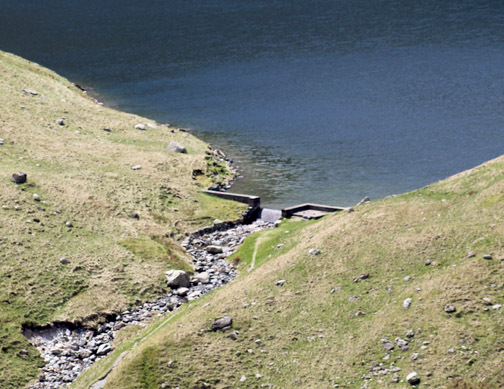 By the side of Small Water are two stone shelters built for quarry men or travellers of old . . . who knows. 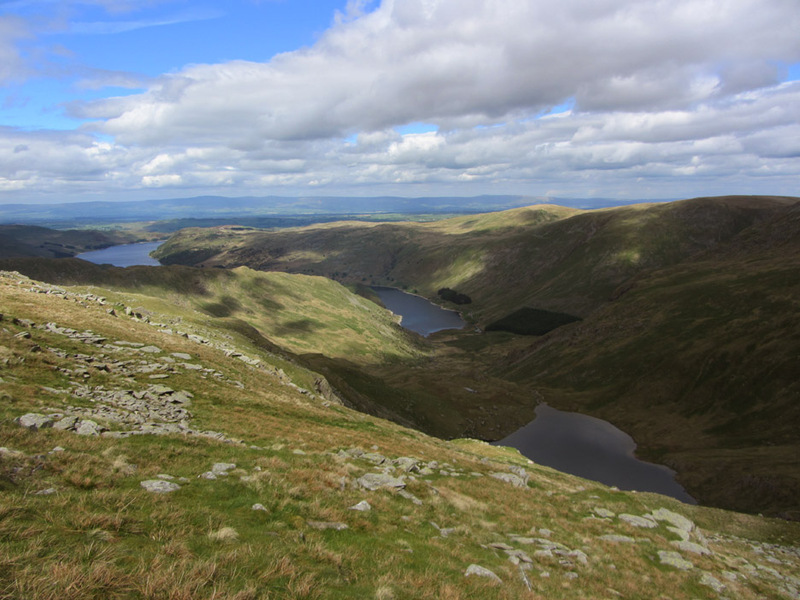 A tent is pitched over looking the lake and the guy was settling in with his family for a night out on the fells. 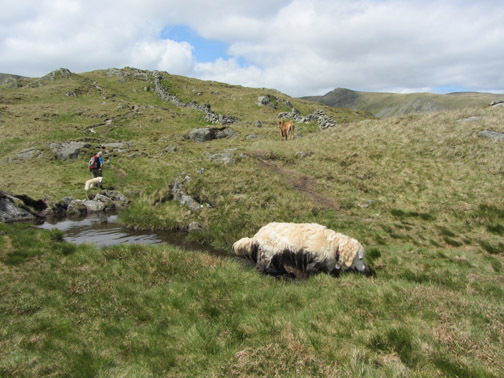 We made our way down alongside Small Water Beck . . . heading back to the car which was once again in sight. 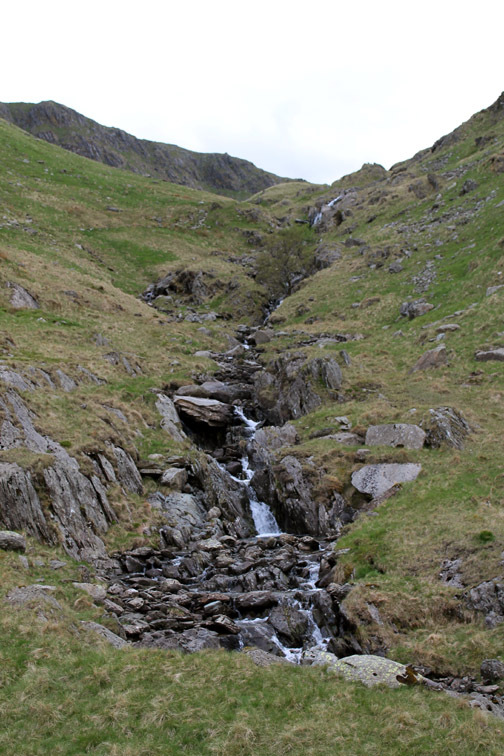 Small Water Beck cascades from below. One last gate and we're nearly there. 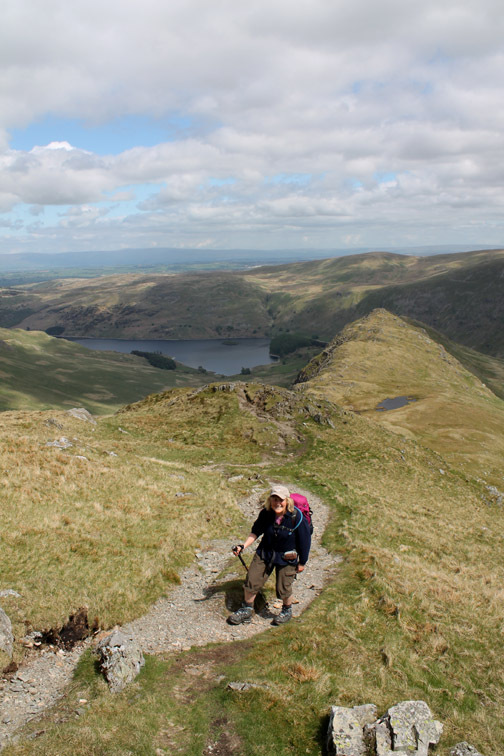 Jo and I take the final path back to Mardale Head car park . . . Ann of course was taking the picture. 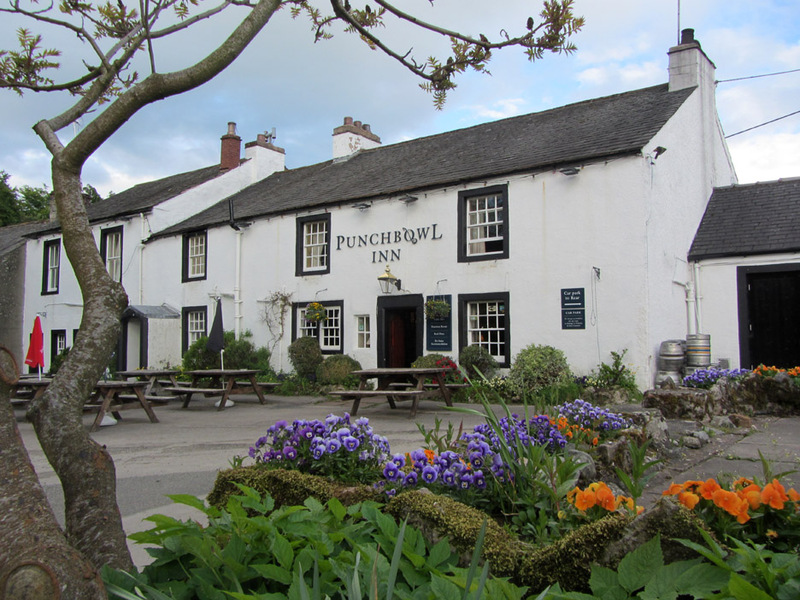 so the Punchbowl in Askham was our new choice for today . . . what a brilliant place ! but now it is OPEN and serving excellent meals and fine ales . . . do call in if you're passing. 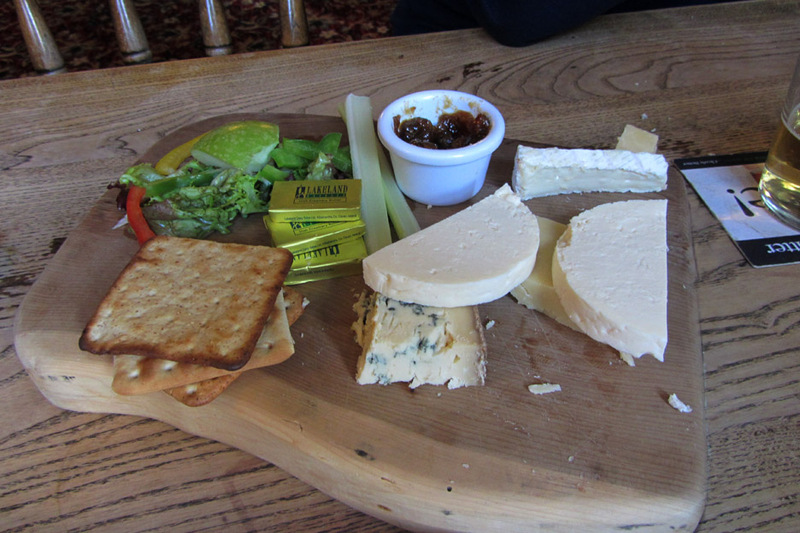 Our Sea Bass with a Thai sauce was an excellent main course and the cheese board a delight for After's. Technical note: Pictures taken with either Ann's Canon Sureshot SX220 or my 1100D SLR digital cameras. This site best viewed with . . .a voucher to eat at The Punchbowl again.